March is Women’s History (or HERSTORY) Month in the United States. Mr. Speaker, each year we celebrate March as Women’s History Month, and I wanted to take this opportunity to honor the women of the Alpha Kappa Alpha sorority for their decades of service and commitment to empowering their communities. Alpha Kappa Alpha Sorority, Incorporated was founded on the campus of Howard University in Washington, D.C. in 1908. AKA is the oldest Greek organization established by African American college-educated women. From its humble beginnings, AKA has grown to 260,000 members with chapters in the U.S., the U.S. Virgin Islands, the Caribbean, Canada, Japan, Germany, Korea, and on the continent of Africa. AKA membership is comprised of distinguished women who have excelled academically, and utilized the organization to promote our mission of “Service to All Mankind.” Through AKA’s human rights outreach, the organization works to raise awareness of human trafficking and domestic violence. The sorority also works to promote social justice through voter empowerment, civic engagement, and expanding access to education in minority communities. Through the organization’s global poverty initiatives, AKA has focused its efforts to end hunger throughout the world, and to promote sustainability and independence through women-owned businesses and sustainable agriculture practices. Mr. Speaker, I am a proud member of Alpha Kappa Alpha, and I am proud to highlight the many accomplishments of the organization. Throughout the years, AKA’s outreach has expanded as it strives to promote high academic standards, mentorship, global health services, and the advancement of human and civil rights. 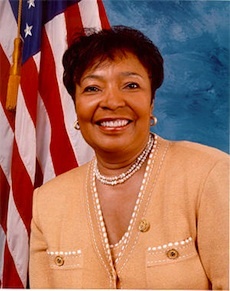 Other current members of Congress who are also our sorority sisters include: U.S. Congresswoman Sheila Jackson Lee (Texas) U. S. Congresswoman Frederica Wilson (Florida).